What is a welcome aboard email? An informal email or message that you send to a new joiner to welcome him/her to the company. An email that you send to all staff to inform them about the new emplyee. Also called joining announcement. Why do you meed a welcome aboard email? The idea is to let the new joiner feel comfortable and welcomed. The message also serves as an introduction to the company's environment and communicates essential knowledge to the them in order to ensure a smooth and quick integration. 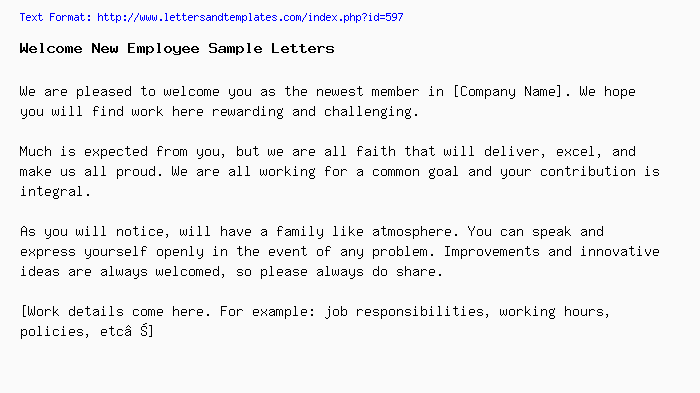 How to write an employee welcoming letter? Start your email with the welcoming statement. Express your delight with the employee's decision to join your company. Praise the joiner on their skills and professional qualities. Tell the joiner how important their work is for the success of the organization and that the expectations are high. Descibe how welcoming and friendly everyone is and how it feels like a big family. Communicate to the employee the important things that they need to be aware of like orientation date and their supervisor name. Attach with your email company policies and guidelines. List the name of the one staff that can best assist in introducing the joiner to the work environment and answer their queries. Wish them luck in their job. We are pleased to welcome you as the newest member in [Company Name]. We hope you will find work here rewarding and challenging. Much is expected from you, but we are all faith that will deliver, excel, and make us all proud. We are all working for a common goal and your contribution is integral. As you will notice, will have a family like atmosphere. You can speak and express yourself openly in the event of any problem. Improvements and innovative ideas are always welcomed, so please always do share. On behalf of everyone at [company name], I would like to welcome you to our team. It’s always a pleasure to acquire motivated and professional individuals like yourself. We are proud to have you with us and I’m sure you feel the same. In order to properly introduce you to our system, I have enclosed with this email the employee handbook. It contains all the information you need to know before starting. Please familiarize yourself with its content and inform me if you have any queries. In addition, you will attend an orientation session on [date] to bring you up to speed with the company policies and vision. [Mr. X] from the [marketing] department will help you adjust to your duties and responsibilities in the initial phase. Please refer to [him/her] for any role specific issues. If you have any questions, please don’t hesitate to contact me. Welcome aboard! I would like to welcome you to [company]. We are excited to have you here with us and would like to wish you the best of luck in your job. As always the case when a new employee joins, an orientation session will be conducted to introduce you into our environment. This will set the mood and give you a feel of how things work around here. For more detailed information, please consult with the employee handbook which will be provided by the HR department. To get you quickly in production mode, you will spend some time with one of the staff in your department who will elaborate into more role related matters. Please take your time to understand your responsibilities and tasks. We have a very cooperative team and they will all assist you in settling down, so don’t worry. I am sure there are many things that you need to inquire about, so please always share your thoughts so that we are all on the same page. I look forward into years of fruitful cooperation. We wish you the best of luck. Welcome aboard! On behalf of everyone at [company name], I would like to welcome you to our company. We are always looking for opportunities to reinforce our team. Your recruitment comes in line with this strategy which is why we take pride in our [services / products]. It is always important to have the right person for the right job, that’s how we manage to stay on top. You and everyone at this company are valuable and much appreciated. We want to make sure that things stay this way. It’s our job to make you feel comfortable and excited about your job. It is very important that you like it so you can excel at it. As long as you are passionate about what you’re doing, you will certainly feel happy and satisfied with your job. So go head and give it all you’ve got. Grab the opportunity and make yourself indispensable. We wish you the best of luck in your new job. Welcome to our team.